I can’t recall how often I’ve heard Christians quote Paul’s approach to the Roman Empire as the blueprint, more or less, for Christians living in American democracy. Then again, I’ve also lost track of how many times I’ve heard Christians quote Jesus’ approach to the Roman Empire as the blueprint, more or less, for Christians living in American democracy. The trouble that I have found in both approaches is that both assume too many things when aligning the Roman Empire and America today. Sure, there are plenty of ways that America has brought benefits to its citizens and to people around the world. However, America has also been a force of colonial power and oppression both to the Native Americans in our land and among certain nations around the world. And having said all of that, there is no American leader who claims to be a deity and demands the worship of its citizens. Dissent in America is welcome and protected by law. Even in the worst case scenario of a citizen taking up arms against the government, there should be a legal process—although that will play out differently in some cases since a black man holding a cell phone may be shot dead by police, while a group of white extremists can take over federal land and then walk out of court free men. Inconsistencies aside in American justice and policing, no one is going to be tortured for days via crucifixion for leading an opposition political party or for opposing the government. The closest America came to this Roman practice of “justice” was the lynching of black Americans, although David Cone points out that this traumatic act of intimidation and terrorism was intended to suppress the black population and to enforce white supremacy. Jesus and Paul operated in a time of Roman colonial power and exploitation. There were no elections to determine if Caesar would be in charge. There were no political parties. Any kind of political organizing was viewed with extreme suspicion, and it was the mere perception of Jesus’ political aspirations that drove the Jewish leaders to conclude that they would lose their city to a Roman army if Jesus was allowed to continue walking around when people called him their king and Messiah. Their fear of Roman reprisal was so great that Caiaphas concluded it was better to kill a single man, even if he was innocent, then to risk calling the attention of Rome’s touchy imperial leaders. Living when and where he did, it’s preposterous to use the example of Jesus to assert that Christians shouldn’t be involved in politics at all or that Jesus never would have supported government programs like healthcare or social security. Rome just plundered people, period. Under the circumstances of crushing military rule, extreme taxation, and minimal resources or political friends, the Jewish people at the time of Jesus had no other option than to be generous with each other. If they asked the Roman government to give them better services, they would have likely ended up on a cross. If the government only serves the interests of an imperial power, the best that you can hope for is to stay out of its way and to help others when you can. In the case of Paul, there were even greater concerns that the Roman government and local officials reporting to them would get in the way of his missionary work. Paul and his companions faced imprisonment, beatings, and death, among many other daily attacks and slanders. We shouldn’t expect Paul to suggest working with this government, and we certainly shouldn’t expect him to rally anyone to lobby for legislation. He knew that his only option was to stay off the radar, to be cooperative as often as possible, and to avoid any kind of agitation that would hinder his missionary work or put the churches in danger. Today, we can elect our government officials and enact policies that can help or hurt individuals. We can charitably debate which political party or ideology is most in line with the command to love our neighbors, honoring the God-given dignity of individuals, and cares for the sacred creation of God, but I don’t think you can argue against the need to vote on politicians and policies for the sake of our neighbors and creation. I can’t imagine that Jesus or Paul thought of themselves as setting up a once and for all time policy on government and voting. They were trying to survive under the boot of a powerful Empire, avoiding allegiance to an idolatrous and corrupt regime without raising suspicions unnecessarily. Can we imagine a Civil Rights movement today without the language of Scripture and the law of love resonating throughout the sermons, speeches, and marches? Today we have the power to use our votes for the welfare of our neighbors, to set up a government that treats all with justice and equality. We all have a part to play, provided that we are wary of being played by the government when it hopes to exploit religious groups for its own gains. What Should a Trump Survival Guide for Christians Include? A podcast billing itself as a survival guide for the Trump presidency recently announced on “the Twitters” that it would be sharing an interview with a prominent evangelical author who has frequently endorsed Trump. There was quite a bit of pushback (**me waving**), and then there was pushback on that pushback (**friends I respect waving back**), and well, you know how Twitter goes. DON’T YOU CARE ABOUT DIALOGUE?!?!?! The premise of the podcasters is that we need to understand the people who support Trump in order to survive the Trump presidency. I respect the makers of this podcast, and I saw respected friends stick up for them. From where I sit, it is useful to understand what motivates people to support Trump in the grand scheme of things. It’s not a waste of time to listen to Trump supporters to a point, but actually “surviving” the Trump presidency day-to-day is quite another matter. I would argue that we need a different toolbox in order to be healthy and constructive under Trump. To begin with, most people know why voters chose Trump, even if many Trump supporters probably don’t actually see the full implications of the racial, protectionist, sexist, or Christian nationalistic aspirations that have driven their support of Trump. For progressive Christians, especially progressive evangelicals, we’re especially aware of what evangelical Trump supporters are going to say. This has been our world for longer than the 2016 election. I grew up with these people. I wrote research papers in my Christian high school about the topics that Trump voters care about. I can pick up the phone and call Trump supporters. I’ve been up to my eyeballs in people who voted for Trump since I was in middle school. Even so, if I feel the urge to refresh my knowledge of Trump supporters, I can read the many softball profiles offered up by the NY Times about the sensitive white supremacist who lives down the block but trolls people of color online when he’s not at work. And while many Christians and progressive evangelicals are rolling their eyes at the thought that we need more dialogue with Trump supporters, that isn’t to say that I want to shut Trump supporters out of my life. I’m just done hearing why they love Trump. In fact, if we actually want to build bridges and to transcend what divides us, experts say that we need to make connections with people on topics other than the partisan politics that divide us. Moreover, while I understand what drives Trump voters and I can also acknowledge my blind spots and bias, I have yet to have an interaction with a Trump supporter who can meet my arguments against Trump with reasoned understanding–not a rebuttal, just an acknowledgement of understanding where I’m coming from. I’ve had lots of Trump supporters express their disappointment at how deceived I am, I’ve had many shouts of fake news, and I’ve been told how they just can’t understand why I believe what I do. I’m not trying to be dismissive. This has just been my experience up to this point. All of that to say, I think it’s more productive to develop compassion, to develop real day-to-day survival strategies, to understand the infrastructure that has helped give rise to our current situation, and to then explore ways we can either challenge it or undermine it through direct action. I had a severe panic attack on the night of Trump’s election. It was the first time I ever lost an entire night of sleep because I was literally shaking in fear. How could anyone trust such an unstable man with the nuclear weapons and military power of America? Contemplative prayer has been a bedrock for my daily life under Trump. I have had to routinely let go of my fears and anger as I approach God in silent surrender. 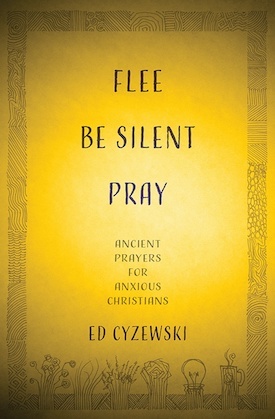 You can learn the basics of contemplative prayer at www.contemplativeoutreach.org or pick up the book Into the Silent Land for a helpful introduction and guide to the basics of contemplation. Also, consider how people of color have integrated contemplation into their activism with the Mystic Soul Project. The anxiety of the Trump Administration has also resulted in major changes in how I use social media. We need to stop seeing the information on social media as roughly equal. Social media is where propaganda, speculation, and anxiety can thrive. We are living in a time of information warfare. This is why Russian influencers spent so much time and money on ads and fake bots on social media. Surviving this presidency means looking at world events with a more critical eye. We have to enter into the realm of the speculative at times, entertaining various “what if” scenarios. What if Twitter is being used as a psychological weapon against us? I personally have a lot of questions about how the North Korean missile tests seemed to pop up with a kind of regularity for a season and then disappeared. I try to avoid scrolling through social media. I use apps like Self-Control to block social media for long stretches and “Kill News Feed” for Chrome so that I’m not tempted to scroll through Facebook. I don’t have social media apps on my phone. Most importantly, I’m very careful about my news sources, avoiding sensationalized outlets or articles. I look for lawyers, former law enforcement officials, and reputable organizations like the Southern Poverty Law Center to offer analysis on events. After Trump’s election, I started following a lot of Republicans, conservatives, and independents on social media, the majority were “never Trump” Republicans. My Twitter feed is a mix of progressive evangelical activists and conservative thinkers some days, with the likes of Richard Painter, Rick Wilson, Evan McMullin, and Bill Kristol showing up to offer takes on events that I wouldn’t have sought out in the past. We need strong coalitions with people who would otherwise be our opponents in order to defeat Trump and those who share in his ideology of white supremacy and unchecked power. These conservative and independent thinkers have changed my mind at times, but most importantly, they have confirmed my suspicion that many Americans share a great deal of common ground. The truth shouldn’t be partisan. Under Trump, it has become partisan to state reality. There aren’t two sides when one side is lying. Coming to the “center” in the case of collusion with a foreign power just means… collusion. Coming to the center for compromise with unbridled corruption is still corruption. Further discussion of common ground on certain issues could be truly productive for people of all political persuasions, and that is something worth exploring further. When Americans discuss which policies work and which don’t apart from the echo chambers of political ideology, there is a great deal that we can sort out. For instance, many gun control measures have popular support behind them, but politicians who are owned by the NRA have “shot” them down. We have learned that calling elected officials can help change votes on key legislation. We have learned that marching together can create momentum and energy. We have learned that voter turnout is essential for swinging an election. We have learned that sometimes a centrist candidate can be effective. We have learned that the voting rights act really is needed as voter suppression laws continue to disenfranchise voters. I am turning to the activists who have generations of experience in direct action to help me move forward. Rev. William Barber II and Jonathan Wilson-Hartgrove are a great starting point for those who want to fuse their faith with biblically inspired activism. I am very interested in learning from the many, many activists in my own evangelical movement and those activists who have a history of working toward positive change in our country. If the activism of the Christian nationalist right created the atmosphere for Trump’s rise, it’s my hope that the moral fusion politics of Barber will offer one of the alternatives that we badly need. I have no doubt that there are many other productive ways to forge ahead and to survive the Trump presidency. I do, however, doubt the value of more interviews with Trump voters/supporters. If Trump voters want to talk to me in order to understand my beliefs, I have a contact form that is open to anyone. Most importantly, I welcome everyone, whether a supporter of Trump or not, to join me in the Christian practice of contemplation, to sit at the feet of activists working for justice, and to listen to a broad range of qualified, well-sourced political thinkers, journalists, and lawyers. Christianity has language for change and repentance. Christians value truth and mercy. There is room for everyone in this place who wants in. I have no interest in preserving a kind of moral high ground that is apart from Trump supporters. If you want to chat with me, you are welcome. By the way, I’m not writing off that Trump survival guide podcast—even if I am critical of the first episode. Future episodes will most likely be better. Hey, we all want to survive this administration together. Like I said, we have a lot of common ground.